I got this as a birthday gift. 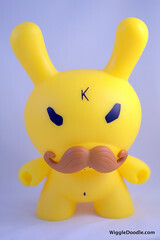 It's an 8-inch Dunny created by Frank Kozik for the Swatch x Kidrobot collaboration. It also comes with a transparent Swatch. According to online sources, Kozik does not play tennis so it was quite a surprise that he called this toy a tennis pro.